The key design goals for the V12 were to extend frequency response at both ends of the spectrum, improve low-level detail, and provide perfect loudspeaker coupling. All have been successfully achieved, along with superb reliability from the low-priced Pentode output valves. The amplifier is perfectly stable into any load, and will offer years of reliable service. The circuit is not the V12's only unique feature; the casework is also unique. Tim wanted a more natural, harmonious look to his new amplifier, something less aggressive than traditional designs with their exposed, industrial looking transformers, hard angles, and valves sticking up in the air. The fascia is rounded, in a half-moon shape, with the left and right channel valves positioned on opposing sides of the top of the chassis. The V12's finish is exemplary, with wood-capped valve covers, chrome fascia, and gold-plated control knobs. The name V12 was inspired by Tim's passion for the classic Jaguar V12 engine. Tim decided to use 6 EL84's per channel in the new circuit. 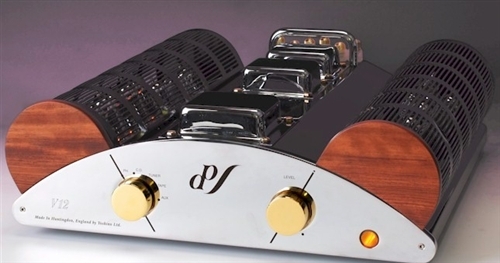 Comparisons to the best motor car engine in the world are valid, for this amplifier is so very smooth and sophisticated. There is very little to give the V12 away as a valve amplifier. Its openness, speed and authority are beyond comparison. Seeing and hearing is believing. The amplifier is 50 watts per channel, has 5 line inputs, and can be connected to any loudspeaker load from 4 to 16 ohms. It is perfectly stable into any load, and will offer years of reliable service.